Wisconsin can boast many cultural icons and famous personalities, everything from Harley Davidson, Miller Brewing, the Packers, cheese, and political firebrands like Robert LaFollette and Joseph McCarthy. In this inventory one can add literary luminaries like the Pulitzer Prize-winning playwright Thornton Wilder and novelist Edna Ferber. While Wilder and Ferber are highbrow artists, a literary maverick often overlooked was the pulp publisher Raymond A. Palmer. With a prolific output that included editing science fiction magazines, writing stories and columns, and making appearances in the nascent movement of science fiction fandom, Palmer thrived from roughly the 1930s to the 1960s. 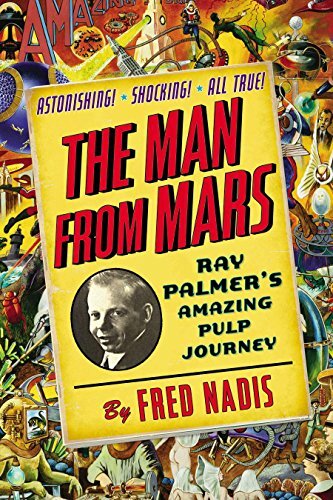 Fred Nadis, a writer specializing in popular culture, popular religion, and science has written a biography of Raymond Palmer in The Man from Mars: Ray Palmer's Amazing Pulp Journey. Palmer was born on the south side of Milwaukee, Wisconsin, in 1926. People thought he was a beautiful baby, enough so that he became a poster child for “Milwaukee's Healthiest Babies” in a Gridley Dairy Company promotion. But Palmer's beauty ended in a near-fatal automobile accident. Suffering through surgeries and a harrowing stay at a Wauwatosa, Wisconsin, tuberculosis sanitarium, he came out permanently disabled. Extreme back pain would make him double over, suffering. Unfortunately, the damage would last his entire life, leaving him little over four feet tall and a hunchback. This setback might have depressed other people, but not Ray Palmer. If anything, Ray Palmer thrived on adversity. After a stint working menial jobs, he happened upon an opportunity to enter the publishing world. Mr. Nadis traces the twists and turns of Ray Palmer's long, strange career. Beginning as a science fiction fan, he wrote and submitted stories to the pulps in the 1930s. He eventually became an editor of publications like Amazing Stories and Cosmos. One reason many critics and historians overlook Palmer is because he leaned more toward lurid space opera than the hard science fiction favored by critically acclaimed writers like Hugo Gernsback. To many, Ray Palmer killed science fiction. Then again, it is hard to satisfy the rigid views of self-anointed purists. But Palmer's alleged dumbing down of science fiction was only one chapter of his career in publishing. After WW II the science fiction pulps gradually lost popularity. Palmer, ever resourceful and the consummate showman, hopped on the UFO bandwagon. He popularized the UFO phenomenon, which would eventually burgeon into everything from Independence Day to Area 51 conspiracy theories and the X-Files. In the 1940s he had a fateful meeting with one Richard Shaver, a fellow Wisconsinite with his own eccentric view of the world. Shaver was an itinerant worker and farmer who had visions of an underground world and secret alphabets. After reading a number of Shaver's strange letters, Palmer heavily reedited them into a viable science fiction tale. But the Palmer-Shaver relationship would yield more strange ideas, hidden conspiracies, and ancient alphabets. In today's cultural scene, Shaver would be considered an outsider artist, but in the 1940s and 50s, there were few outlets for mentally disturbed individuals with artistic inclinations. Stranger still were Palmer's political convictions. A lifelong individualist, he was not a fan of the New Deal or unionization. Despite the camaraderie and eccentricities of early science fiction fandom, Palmer made a huge political gaffe in 1968 when he came out with an endorsement for segregationist presidential candidate George Wallace in one of his columns. Palmer bent over backward doing the obligatory damage control, but he lost respect and credibility among his many fans. An epistolary correspondence with an African American fan helped repair his image, but the damage was done. Man from Mars provides a fascinating glimpse into a little known regional writer from Wisconsin and his many influences. Mr. Nadis traces the influences far and wide, ranging from science fiction conventions (Palmer was one of the earliest fans), conspiracy theories, outsider art, hollow earth theory, unexplained phenomena, UFOs, and non-mainline religions. Ray Palmer was part Isaac Asimov, part P. T. Barnum, and part Charles Fort, a legendary American icon—shining most brightly in kooky waystations of various subcultures.